The first book of the New Testament makes it abundantly clear who Jesus is: the Immanuel (God with us), and Saviour of the world. It shows us how Jesus fulfilled all that was predicted of the Messiah, and how His death and resurrection would bring salvation and reconcile people to God. Embark on a journey of the Gospel of Matthew and let this truth of Jesus' eternal authority change your walk with God. Be challenged as you take up Jesus' call to follow Him, and discover what it means to lead a life of total commitment to the Messiah. The first book of the New Testament makes it abundantly clear who Jesus is: the Immanuel (God with us), and Saviour of the world. It shows us how Jesus fulfilled all that was predicted of the Messiah, and how His death and resurrection would bring salvation and reconcile people to God. 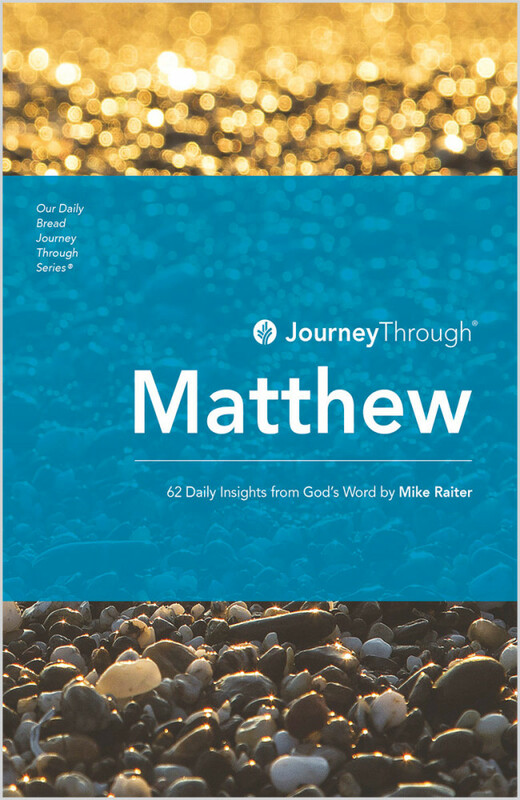 Embark on a journey of the Gospel of Matthew and let this truth of Jesus' eternal authority change your walk with God. Be challenged as you take up Jesus' call to follow Him, and discover what it means to lead a life of total commitment to the Messiah. This devotional series from Our Daily Bread Ministries provides assistance to those who desire to spend time with God in His Word, book by book. The daily insights will help Christians discover the precious, life transforming wisdom of the Bible, inspiring them towards a closer walk with God. Perfect for personal devotions. Mike Raiter is a preacher, preaching trainer and former Principal of the Melbourne School of Theology in Australia. He is now Director of the Centre for Biblical Preaching and the author of a number of books, including Stirrings of the Soul, which won the 2004 Australian Christian Book of the Year award.